Young people from Group of 8 (G8) industrialized nations and from the developing world met with German Chancellor Angela Merkel in Berlin today as part of the Junior 8 Summit (J8), an international youth conference with an agenda that mirrors that of the G8 Summit commencing tomorrow in Heiligendamm, Germany. Among J8 representatives are eight delegates from Quebec. The team, named Act Now For Tomorrow, was chosen from nearly 100 entries from across the country to represent the voice of Canadian youth. In addition to their meeting with Chancellor Merkel today, J8 representatives also held a press conference with UNICEF Goodwill ambassador Sir Roger Moore in Berlin. 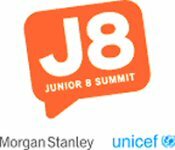 The Junior 8 Summit is a joint initiative sponsored and spearheaded by UNICEF and the Morgan Stanley International Foundation (MSIF). It aims to strengthen the voice of children and young people and enhance their ability to influence decisions at the G8. In addition to direct interaction with world leaders at the G8, the J8 program empowers young people to discuss key global issues and to advocate for urgent solutions and actions by G8 leaders, by fostering a global youth movement around issues on the international agenda. In preparation for their meeting with G8 leaders later this week, 64 young people from G8 countries and ten children from developing countries gathered on Sunday in Wismar, Germany, for a week-long forum to debate four key issues: prospects for economic development in Africa; HIV/AIDS; climate change and energy efficiency; and new global challenges - among them intellectual property rights and corporate social responsibility. On 7 June, eight of the young people will have the chance to voice their concerns directly to G8 leaders when they meet them face-to-face in a live, televised conference. German Chancellor Angela Merkel, who invited Junior 8 participants to her office in Berlin prior to her departure for Heiligendamm, applauded their participation and input. "The G8 has set out an ambitious agenda for the upcoming summit in Heiligendamm," Chancellor Merkel said. "We want to address questions around world economics, achieve better climate protection, and further deepen our partnership with Africa. I am looking forward to discuss these issues particularly with young people and to learn about their ideas and wishes for the future. These discussions are an important part of our preparations for the summit." Speaking from New York, UNICEF Executive Director Ann M. Veneman said, "Issues being discussed at the G8 directly impact on the lives of children and young people. UNICEF applauds the G8 for taking the time to listen to the voices of youth. And we congratulate the J8 participants for giving serious thought to the kind of world they wish to inherit." Morgan Stanley Chairman and Chief Executive Officer John J. Mack commented: "The Junior 8 teams are an outstanding example of the commitment of today's young people to dealing with the most significant social, environmental and economic issues. Morgan Stanley is proud to be a co-founder and sponsor of the J8, which gives today's youth a much-needed voice on the global policy stage. It is critical that these students' progressive views be shared with the world they are inheriting", he concluded. Too often the issues central to the G8 are not considered children's issues. However, a closer look at startling statistics on HIV/AIDS, poverty and global climate change shows that these topics are all too real for the world's children. - An estimated 2.3 million children under 15 have been infected with HIV and 15 million children have been orphaned by AIDS. Of those requiring pediatric treatment, only 10 per cent have access to such treatment, and only 11 per cent of HIV-positive pregnant women have access to services to prevent-mother-to child transmission. - Every three seconds a child dies as a result of poverty, and 300 million people are still suffering from hunger. Around 5.5 million children die from malnutrition every year. - According to Save the Children, in the next decade, up to 175 million children are likely to be affected every year by natural disasters brought about by climate change. By 2010, 50 million people will be 'environmentally displaced,' most of whom will be women and children. J8 participants include teams of eight young people aged 13-17 years from each of the G8 member countries: Canada, France, Germany, Italy, Japan, the Russian Federation, UK and USA. An additional ten J8 delegates from developing countries - Algeria, Brazil, Cameroon, Central African Republic, China, Ethiopia, India, Moldova, Sierra Leone and Tanzania were selected by UNICEF. On 7 June, all of the J8 participants will travel to Heiligendamm, eight of whom will be selected to present their views to world leaders gathered for the Summit. The footage from the meeting with G8 leaders will be transmitted live and pooled by broadcasters ARD and ZDF. J8 is the youth event linked to the G8 Summit and has been developed and supported by the Morgan Stanley International Foundation and UNICEF. J8 aims to advance young people's understanding of global issues and to provide a platform for them to discuss and advocate on these issues with some of the most powerful leaders in the world. Morgan Stanley is a leading global financial services firm providing a wide range of investment banking, securities, investment management, wealth management and credit services. The Firm's employees serve clients worldwide including corporations, governments, institutions and individuals from more than 600 offices in 30 countries. The Morgan Stanley International Foundation is the Firm's charitable grant-making arm in Europe. It was established in 1995 and is registered as a charity with the Charity Commission for England and Wales. Its main purpose is to make grants to not-for-profit organizations which benefit the communities in Europe and South Africa in which Morgan Stanley has a physical presence. While grants are made to all sectors, including health and social welfare, the main focus of the Foundation's support is in the area of education, training and employment. For further information about Morgan Stanley, please visit www.morganstanley.com. UNICEF is on the ground in more than 150 countries and territories to help children survive and thrive, from early childhood through adolescence. The world's largest provider of vaccines for developing countries, UNICEF supports child health and nutrition, good water and sanitation, quality basic education for all boys and girls, and the protection of children from violence, exploitation, and AIDS. UNICEF is funded entirely by the voluntary contributions of individuals, businesses, foundations and governments. Video profiles of J8 participants from Brazil, Ethiopia, India, Moldova, Russia, Sierra Leone and Tanzania portraying participants "back home" will be available on www.thenewsmarket.com/unicef. The meeting between J8 participants and G8 leaders on 7 June will be available through ARD/ZDF.